Happy (belated!) Divine Mercy Sunday! Divine Mercy Sunday is a special day which focuses on the extraordinary mercy of Jesus. And He has a lot of mercy to share! Just look at His reaction to His disciples, if you don’t believe it. In the immediate aftermath of the Resurrection, things were looking grim. His disciples had pretty much abandoned Him, all of Jerusalem essentially rallied for His death, and things were bad. So, what did He do? Instead of enacting vengeance on all — which, honestly, considering everything He had been through, was completely justified — He appeared to His disciples and gave them His blessing of peace. That… kind of mercy is amazing, to be completely honest. So, it is fitting that we celebrate the Feast of the Divine Mercy the week after Easter! But, believe it or not, Divine Mercy Sunday is a rather new occurrence which was started with the promptings of St. Faustina. So, who is St. Faustina and how did this devotion get started? St. Faustina was a Polish nun and mystic whom Jesus appeared to often. Born in 1905, she was able to have conversations with Jesus that she recorded in her diary, which was later published and you can read today (Note: that link is an affiliate link!) At the age of 19, Jesus instructed her to join a convent. So! She left her home (without her parents’ permission, no less! ), traveled to Warsaw alone with nothing but the dress she was wearing, went to mass in the first church she saw, and asked the priest for help joining the convent. The priest, realizing that she was in a bit of a bad spot, put her up with a parishioner whom he trusted so she could join the convent. She asked for permission to enter many convents, but most convents rejected her, thinking that her poverty was the sole reason why she wanted to enter into the convent. It was only until she reached the convent of Congregation of the Sisters of Our Lady of Mercy that the mother superior decided to take a chance with her — as long as she could pay for her habit. Not being able to paint (though she tried her best! ), St. Faustina turned to the sisters, who didn’t initially support her mission. It was only until she returned to Vilnius for the second time when she was able to find help. There, she met Father Michał Sopoćko, the confessor of the nuns and her spiritual adviser, who supported her devotion to the Divine Mercy. She asked Father Michał Sopoćko for help, who in turn hired Eugeniusz Kazimirowski to paint the image according to St. Faustina’s specific instructions. Divine Mercy, by Eugeniusz Kazimirowski, c. 1934. (This image is a reproduction of the original artwork with English words; original words were in Polish.) Original is located at the Sanctuary of the Divine Mercy, Vilnius, Lithuania. The image really doesn’t do it justice… it’s supposed to be displayed high up on a church wall, so that Jesus seems to be looking down at you, as if He is paying special, loving attention to you. The image represents Christ in a walking posture against a dark background in a white garment, girdled by a band [belt, cincture]. With the right hand, raised to the height of the shoulder, He is blessing, and with the left one (with two fingers) He is opening the garment somewhat in the area of the Heart (not visible), from which are coming out rays (on the viewer’s right a pale [colorless] one, and on the left a red one) in various directions, but principally toward the viewer. Sister Faustina called attention to this, that the right hand not be raised above the shoulder, not to bend forward, and only place the left foot forward to indicate movement, that the garment be long and somewhat fallen into folds at the bottom, that the Lord Jesus’ gaze be directed a bit toward the bottom, as it happens when, standing, one looks at a point on the ground a few steps away, that the expression of the face of Jesus be gracious and merciful, that the fingers of the right hand be upright [erect] and freely lie close together, and on the left [hand] — [that] the thumb and index fingers hold open the garment; that the rays not be like ribbons [bands] hanging down toward the ground, but that with intermittent [broken] strips [streaks] they be directed toward the viewer and lightly to the sides, coloring to a certain degree the hands and surrounding objects: that these rays be transparent in such a way that through them the band [belt, cincture] and garment be visible; that the saturation of the rays with redness and whiteness be greatest at the source (in the area of the Heart) and then slowly diminish and vanish [dissolve, fade away]. You might not have seen this image, since it’s not the most popular Divine Mercy image! In fact, this painting was lost for decades… which honestly probably saved it from being destroyed by the communist regime when the Soviet Union took over Poland. 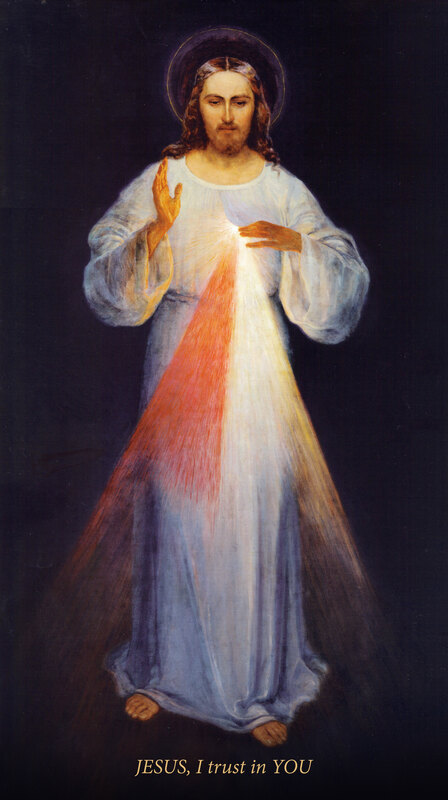 However, this artwork was the original one commissioned and the only Divine Mercy image that St. Faustina actually saw before her death in 1938. And those words by Jesus were particularly poignant to me. When looking over these religious artworks, it can be tempting for me to look at them simply as technical masterpieces by great artists. But, in the end, the paintings and even the artists are not as important compared to what the art is portraying: Jesus Christ. ← Christ Flying out of the Tomb!